Gathering My Roses: Green Mountain Coffee -- A Very Tasty Review! Green Mountain Coffee -- A Very Tasty Review! Liz and I were blessed to receive a sampling of Green Mountain Coffee a few weeks ago. We tried two wonderful coffee flavours: Hazelnut Cream and Golden French Toast. We were very impressed with both! The Golden French Toast is Fair Trade Certified -- This means that all coffee beans are harvested in a sustainable way and those farmers involved are getting paid fair & livable wages. For more information on Fair Trade certification and what the certification means, visit http://www.transfairusa.org/. Golden French Toast has the lovely, sweet aroma of French Toast, Maple Sugar, and Cinnamon. It's comforting and inviting. Golden French Toast is a Winter Seasonal coffee and is only available for a limited time. I loved it, Liz liked it but it was a bit too sweet for her. I didn't have to add sugar to it... so fewer calories! Benefits all round! Our favourite, however, is the Hazelnut Cream. Ummmm... so delicious! The Hazelnut is a lighter roast and has a warm, nutty aroma and taste. Again, no need for sweeteners here. The coffee speaks for itself. So... what IS Green Mountain Coffee? 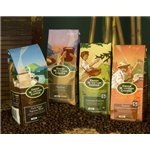 Green Mountain Coffee offers more than 100 high-quality coffees that sell under the Green Mountain Coffee and Newman’s Own® Organics brands, including one of the largest selections of Fair Trade Certified™ organic coffees in the country. 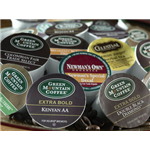 Green Mountain Coffee also produces its coffee as well as hot cocoa and tea in K-Cup® portion packs for Keurig® Single-Cup Brewers. One of the things I love about Green Mountain Coffee is their dedication to serving the World Community. Employee Volunteerism is very important to Green Mountain Coffee as is reducing the Carbon Footprint of their company and it's employees. Two of many programs sponsored by the company. Green Mountain Coffee gives back -- and that's something to celebrate. You can follow Green Mountain's contributions to Social Responsibility at Brewing a Better World. Green Mountain Coffee on Facebook. DISCLOSURE: We received two complimentary packages of Green Mountain Coffee for the purpose of review. We were under no obligation to review this item. We received no monetary compensation. The opinions expressed are based on our own use and experience with the items.